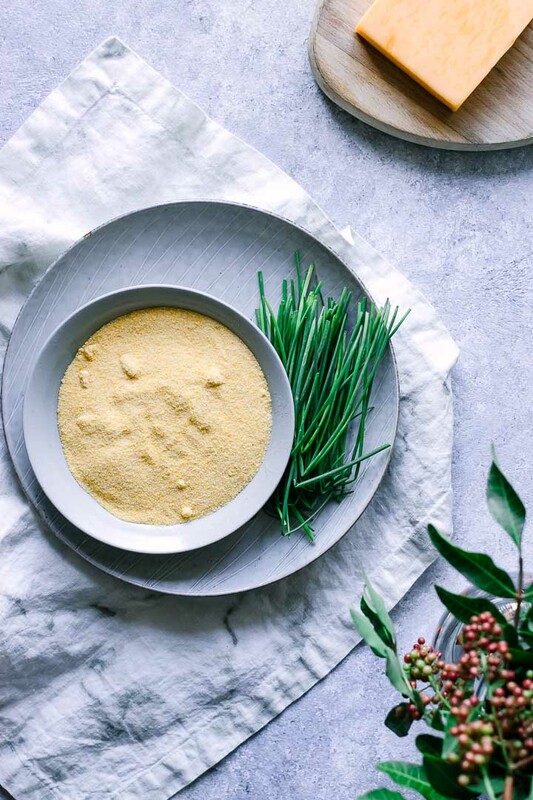 Cheddar Chive Polenta, a simple cornmeal side dish with shredded cheddar cheese and chopped chives that’s ready in only ten minutes. You’ll love this easy 4-ingredient recipe! Do you love polenta? I didn’t grow up making polenta, so it’s always been a dish that I enjoyed only when dining out. It wasn’t a food I considered making at home, and — to be honest — it wasn’t a food I even thought I liked for most of my life. Until recently when I dined out and had a delicious and cheesy polenta dish with fresh herbs. I couldn’t that something so simple could taste so good, and I vowed to experiment with the grain and perfect polenta to share with you all. 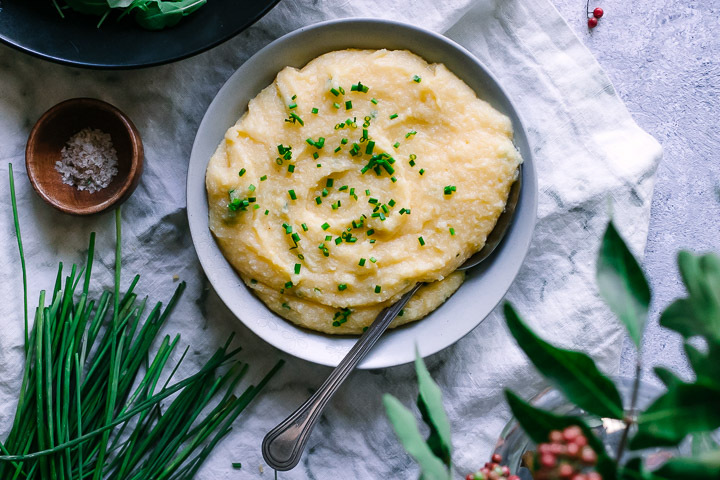 And that’s where this Cheddar Chive Polenta was born — four ingredients and only ten minutes but bursting with big, bold flavor. 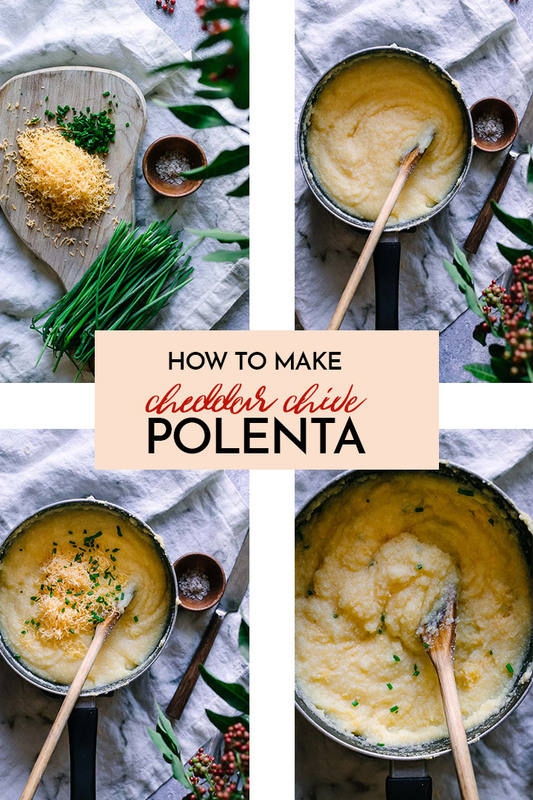 We’ve now had this simple polenta recipe once a week for the past month and I’m super excited to share it with you so you too can fall in love with this easy corn and cheddar side dish. Ready for the so-simple cheesy, chive-y polenta recipe? Let’s do it! Polenta is seriously simple to prepare, and it’s ready in about ten minutes. 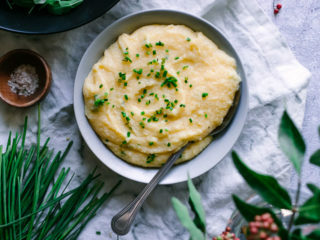 It’s great as a side dish, can be used as a foundational food for stews or roasts, and can be served as a substitute for mashed potatoes or rice. First things first, add the polenta and vegetable broth to a small saucepan and bring it to a boil over high heat. When the polenta starts to boil, reduce heat to medium-low and cover, stirring often. Cook until polenta is thick, but stir stir-able — about 10 minutes. When polenta is done, remove from heat and add your flavorings: salt, pepper, cheese, and chives. Don’t be afraid to experiment with other herbs and flavorings! Choose good quality dairy: yes, any cheese will do, but choosing good quality cheese means from dairies your dollars are supporting good dairy farming practices…and good quality cheese just tastes better! Make it vegan: make this recipe vegan by omitting the cheese, or replacing with a plant-based cheese. Add a bit of nutritional yeast for a cheesy flavor without the dairy! 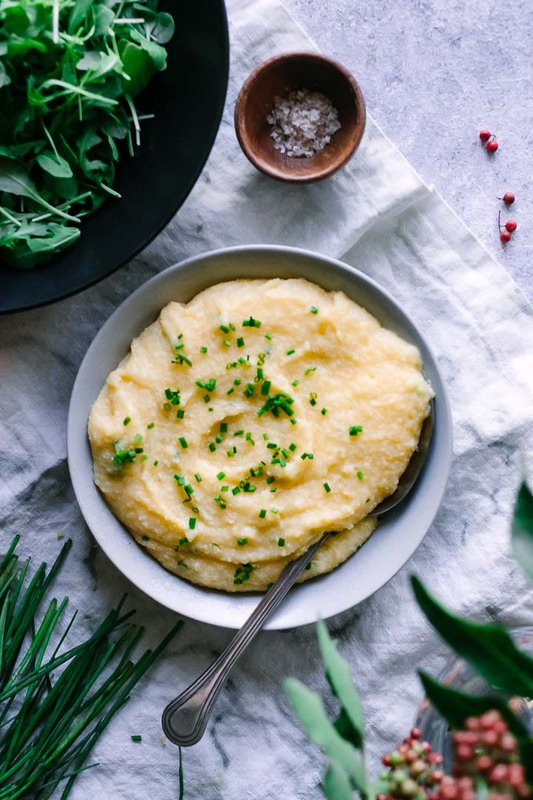 Loving this simple polenta side dish recipe? Check out our other easy seasonal side dishes, like this Braised Mushroom Carrot Polenta and this Brown Sugar Sage Hasselback Butternut Squash recipe. Because eating well doesn’t have to be complicated. Add polenta and vegetable broth to a saucepan and stir to combine. Bring to a boil over high heat, then reduce heat to medium-low and cover with a lid. Cook about 10 minutes, stirring frequently, or until polenta is thick. Remove from heat, then stir in salt, pepper, cheddar, and half of chives until cheese has melted and is well combined with polenta. To serve: top with remaining chives and serve as a side dish or as a base for stews or roasted vegetables. Leftovers and storage: let polenta cool and store in an airtight container for up to four days. Reheat in a sauce pan, stirring in broth or water until smooth. I made this polenta and I loved it! I have had polenta only at restaurants too and I never realized how easy it is. Now I’m excited to try polenta dishes more often. Thanks! That’s great! I’m the same, I love polenta and order it out at restaurants but rarely make it at home. Now that’s changed!